Thanks to all for your immediate reply with offering donations to support Balasubramaniyan’s education. Thanks to Dream India 2020 group for showing immediate action to send DD for Rs. 15,000 and Balasubramaniyan joined college yesterday. Some more people helped him to pay hostel fee. Many well wishers came forward to help him from second year onwards. Balasubmaniyan & family, Headmaster and Dinamalar agent expressed their heartful thanks to DI2020 group and all of us. Thanks to Natarajan for his quick action :-). We came across the below news through one of Tamil Daily News Paper site. Place : Perumalpatti, Srivilliputhur, Virudhunagar District, Tamil Nadu. Father is 75 year old person and he can’t work anywhere. He has two elder sisters. Both stopped after their II PUC due to poor economic background. Mother and two sisters are involved in match-box work and they all make around Rs. 100 to 120 per day. He used to help them in the morning and evening. 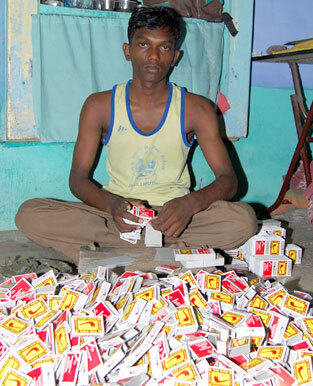 He is studying at Gurugna Sambandar Hindu Hr Secondary School, Srivilliputhur, Virudhunagar District – 626125. He scored 96% in SSLC. After seeing his score, the school management agreed to give free education until his II PUC. He scored 1106 in his II PUC ( Physics : 199, Chemistry :197 , Maths : 192) and THIRD RANK in his school. His school management understood his interests and financial situation, all the teacher collected Rs. 7000 and encouraged him to attend engineering counseling. He got admission at Govt College of Engineering, Thirunelveli (http://www.gcetirun elveli.com/) in Electrical and Communication Branch. (1) He has to pay Rs. 14,000 before 28th July 2008. We spoke to Mr. Periaswamy, Headmaster. He is one of the teacher, who is encouraging him to score high marks and join engineering college. He certified that he is very disciplined boy and has good interests in studies. He is the one gave this news through DINAMALAR News Agent. Headmaster is from very poor background, he is 12th son in his family and he is only one educated in his family. He is pushing bright students every year. Headmaster is talking to his old students to help him for hostel and mess fee. He is going to chennai to meet old students for the same cause. Headmaster opened a Saving account in State Bank of India for him. We can donate to this account directly. We spoke to Mr. Ramanathan, Dinamalar new agent. He is the one visited Balasubramanin’ s home and verified the situation before he publish this news. He also told me that the situation is very poor and asked me to help this student. They are staying in rented house. We spoke to Balasubramaniyan’ s mother. She explained her family situation and all are trying to give him proper education. They have lots of hope on him. After all the verification, I told Headmaster, Balasubramaniyan’ s mother and News agent that WE WOULD SUPPORT BALA TO CONTINUE HIS EDUCATION, if nonone is going to support. School shows good record every year, In this year, a girl student scored 1156 and she is the school first and her financial background is better. WHAT WE CAN DO : Please let me know, if any of you willing to support this poor student. 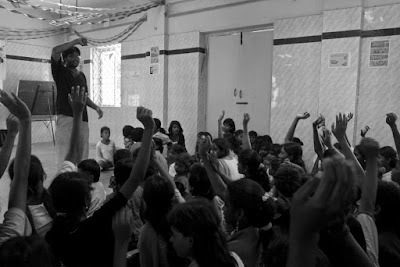 A week before last week(on 19th Jul), we finally setup our libray @ Govt Girls Home, Purasaiwalkkam, Chennai. Attached are the project report, Books list & its numbering format explanation document. The project is funded by TCE_Crescendo(alumnis of TCE – CSE 2003 batch) & Indiasudar. We(me, Raja Soundar, Hari T, Archana K.L, Sundara kumar, Ilaiyaraja, Pravin & two other friends of Hari) co-ordinated the event. I just took the print out of all the ids of books. And, those ppl worked hard to paste them all according to the excel sheet, ordering & categorizing the books, etc. Soundar has donated a book-shelf, few of my roommates dontaed some of the books. One of our members, Arun, donated the whole amt for all the 10 chairs. Heartful thanx to all of them. Table & library room were given by the home itself. Another 3 girls from an organization called Bhumi, also came for spending their time with the home children. They taught the children to speak in English in a playful manner. Some of the ideas were more creative. We can have a partnership with them to enhance our career guidance program. Finally, my friend Sundara kumar(non-member) gave a small lecture to the children abt how to use books, why shud use, etc. The students showed very much enthu to have & read the books. Lets decide on our future libraries based on the comments from these students. Hari & others… if I missed out anything, pl include them too. Last weekend (12 Jul 2008) we (Anil, Prashanth, Raghavendra and Vinod) visited Government Composite High School near Agara. We got a warm welcome from Smt. Usha, High school teacher. 1. Till last year, this school had only Higher primary. High school 8th standard started from last year. 2. Higher primary school has got a National award and a teacher Sri Gopal has received “Best Teacher” award. 3. School looked very clean and the students were very well disciplined. It is good to hear that students take care of the trees and plants in the school compound and involve in the cleanliness of their environment. During the break, we also saw some students spend their time reading Newspapers. 5. Sri Gopal has played a key role in the Science Exhibition, by helping children create some models from Canes, which is easily available in the village. 6. A huge rise in number of students from last year 8th standard (only 8 students) to this year 9th standard (38 students) after getting to know about the success stories of this school. 1. School infrastructure development – Since the high school is recently started, there is requirement of building, which the NABARD has sanctioned. Waiting for funding from government. They are looking for donors who can provide desks for students and alrmairas for office purpose. 2. Urgent requirement is for the floor mats (or “Gemkhana”) for 1st standard and 2nd standard students to sit on floors. They have low desks for these children, but currently children sit on floor and it would be very cold during the rainy and winter seasons. 3. As the high school is recently started, there is requirement of Library books, and Teaching and Learning materials like Charts, Maps, Models. 4. They expressed their interests in conducting some Science talks, Quiz programs. 5. For future, after 10th standard, they are looking for Career counselling. For this year, Notebook requirement, High school fees and bus pass requirements have been fulfilled by the localites and few individual donors. Ravi, Uday and Shiva are visited GERIZIM REHABILITATION TRUST on 9th July 2008 and today (13th July 2008). GERIZIM is registered under Charitable Trust Act No.321/90-91 dated 23.08.90 and they are running home for orphans and mentally challenged children (www.gerizimhome.org). Thanks to Mrs.Vasundra, who brought this home to our notice. We met Mr.Yesudian and his wife, listened their inspiring story. They had started this trust with 40 children and running at their own home along with their children, they used to manage expenses of 42 children with their salary. With the help of his Japanese friends, he got great support from Japanese ambassador after seeing their dedicated service. One of the well wisher and philanthropist Mr.Ramachandra Reddy donated 2 acre land to expand their service to more kids. Now they have home for more than 200 children in 3 different places in Bangalore. There are more than 200 children from all 3 homes. These normal children are sent to near by Govt schools and few studious children go to nearby Carmel matriculation school(depending on fund availability). The age group of children are 1.5 yrs to 18 yrs. 30 special children are staying in ejipura home, while the children above 18 yrs are in Doddakanneli home. 70% of the children are actually sent by Karnataka Child welfare committee. Most of the children are orphans or have single parent. At doddakennali there is also vocational training centre for mentally challenged. They do products like chalks, paper covers for medical stores etc .. There are totally 5 blind children and 1 is doing Music Course and she is practicing veena excellently. The normal school going children need notebooks. We got the complete student’s list and their notebook requirements from Mr. Yesudian. We can support this at present. Dividers in Special children training classes. Currently there is no divider. SO the children are getting distracted during the class. They are managing their food expenses somehow. It was good to know that even small shop at MADIWALA Vegitable market donate small amount of vegetables every week. But they are stuggling to manage their monthly food expenses. They need around Rs.2 lakhs per month to pay for all 65 staff members, but they are able to manage only Rs.70,000 per month. So they are not able to control the attrition rate. They need more sponsors to pay their staff salary. They do collect old newspapers for paper bag making – they make money out of it. You can donate your old news papers to them. Gerizim had asked us, if we can support them with notebooks and stationaries for this academic year. It has been delayed and they are not able to get anyone to donate this until now. The requirement details are attached in this mail. India Sudar is looking forward to help them during this weekend. Carmalaram P.O. Sarjapura Road, Bangalore – 560 035. K.Ravi, India Sudar KA Team. Happy to introduce our New Partner organization Young Helping Minds[YHM] to work together under India Sudar Open Charity Platform to achieve our Common Vision. Our sincere thanks to Raj Kamal(younghelpingminds@yahoo.co.in), who made this partnership from YHM. About: Young Helping Minds mainly works for the education of under privileged students and the students who are congested of education .We also support and conduct events for the growth of children’s in orphanages. The main project of YHM is VELLICHAM which means light in Tamil under this project we select a student who is financially deprived and we support him financially for his/her education and after they finish their studies. We avail them a job and after he/she is well settled we take him as a YHM donor. Currently under this project we are helping 35 students. Address: No: 8,VKK Menon St, Ram Nagar , Ambattur , Chennai -53, TN.